Visible crew/equipment: The shadow of the crew is visible on the captain of the St. George when he enters the boat. Revealing mistake: Just after Loque runs over the countess in his dune buggy, Bond runs over to her, kneels beside her and takes her pulse. She blinks. Continuity mistake: Because Ms. Moneypenny knows that Bond is having a meeting with M, she opens a drawer to use the mirror. She just wants to start to put on makeup and Bond is entering her office. In the next shot her lips a fully red. Continuity mistake: In the scene where Locque is kicked off the cliff by Bond in his car, it is a Mercedes-Benz S-Class, model W 116. But in the shot before, when Locque drives away from Kristatos' warehouse it is the predecessor of that model. Factual error: In the pre-credit sequence with Bond and Blofeld, the helicopter makes a steep dive, however, the sound it makes is for a fixed-wing airplane, similar to dive bombers in WW2. Helicopters make no such sound. Continuity mistake: The ski jump in Cortina d'Ampezzo is in the bottom of the valley - which can also be seen in the overhead shot from the top of the ski jump. But nevertheless Bond has a long ski ride down from the bottom of the jump. And in several shots during the chase it is clear that he is much higher in the mountains than below the city. Deliberate mistake: When Eric Kriegler shoots in the biathlon, the camera looks from behind the target, through the holes of the targets he has already hit. But in the next clip it can be seen that little flaps fall down and cover the holes when they are hit. Plot hole: Bond makes a huge tactical error after diving to the St. Georges. He knows the Russians and their operatives are after the ATAC. The ATAC itself is expendable to Britain, since it has a self-destruct mechanism that under proper procedure would have been set off when the ship sank. So why is Bond trying to retrieve it? Because he disarms the self-destruct, he actually allows Kristatos to get his hands on it, forcing Bond to track it down again and, to stop the Russians from getting it, HE DESTROYS IT! So why doesn't Bond, instead of disarming the self destruct, set a timed charge or toss a grenade in the room to destroy the ATAC while its at the bottom of the sea? The answer is, of course, that if Bond destroys the ATAC before the bad guys can get at it, the movie's over. Even so, at the end, when Bond finally does destroy the ATAC, he tells Gogol it's "detente. You don't have it. I don't have it." Clever line, but it reinforces the fact that the British don't need it. They can build another one. Factual error: It is impossible to fly a helicopter with both hands on the stick. Revealing mistake: When Bond throws the dead pilot out of the helicopter, you can tell it's a dummy as its arms and legs bend at impossible angles. Continuity mistake: During the car chase in Spain, when one of the two black cars bump into Melina's 2CV, we see a close up of the driver and there no vehicles visible on the road behind him. In the next shot when the 2CV is pushed off the road, the second black car is almost directly behind him. Revealing mistake: When Bond and Melina are being chased in Melina's car, they are rolling upside down in a street of a small village. With help of some other people they tilt back the car on his wheels. At that moment you can see specially added roll bars mounted in the car to prevent the roof from crushing. Continuity mistake: When Bond and Melina are being chased in Melina's car, after they roll down the hill and hit the road, the tires actually bend under the car. Then when they drive again, they are straight. Visible crew/equipment: In the first seconds of the car chase, when Melina's car drives off, a reflection of crew and equipment can be seen in the car's windows. Visible crew/equipment: At the end when Max the parrot drops Bond's watch into the water you can see a piece of wire lowering it in. Continuity mistake: In the last scene with the watch and the parrot on the perch, the watch strap is fully open, however, when the parrot throws the watch in the water, the strap is closed. Continuity mistake: During the fight at the ice rink, one of the ice hockey players tries to kick Bond with his blade and makes a hole in the wall in the process. In the next shot, when another player tries to hit Bond with his ice hockey stick, the damage to the wall has suddenly disappeared. Continuity mistake: Near the end when Kristatos slaps Bibi, you can see the difference between two takes. Continuity mistake: When Melina's car is hit by the machine gun, we see a close-up of the back end of the car, including the 2CV6 sign. 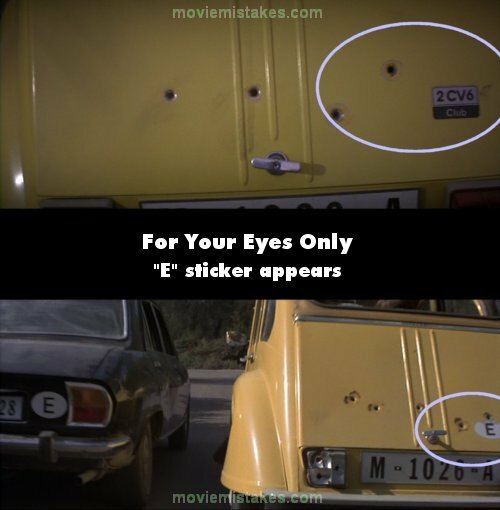 Later in the car chase there suddenly is a Spanish national sticker (E) to the left of the 2CV6 sign. James Bond: Forgive me father, for I have sinned. Q: That's putting it mildly,007. British model Caroline Cossey, who appeared as of the women in the film was revealed after the film to be a transsexual. She was born a man.